"Native American Church welcomes all to celebrate"
OHSWEKEN - Last weekend the Iroquois Women's Circle had another very successful conference at J.C. Hill School gymnasium in Ohsweken. As usual, the speakers were from far and wide. Tom Alcoze who belongs to the Bear Clan of the Cherokee Nation came all the way from the University of Arizona. Phil Lane of Yankton Sioux and Chickasaw lineage came from Lethbridge, Alberta. Lee Brown a Cherokee of the Wolf Clan travelled from British Columbia. Two ladies, Verbena Green and Bertha Groves were from Oregon. Others were from points not quite so distant. As I listened to the speakers, I twice heard reference to the Native American Indian Church. The second time I heard it, I made a mental note to talk to the speaker about it if I got the chance. On the second day I got an opportunity to ask Bertha Groves about this. Bertha Groves is an elderly native lady with merry eyes sparkling behind her glasses. I was going to say she was a grandmotherly type of person but I believe she is actually a great-grandmother. She belongs to the Southern Ute Nation of Oregon and is a teacher of their culture and language. It is after the Utes that the state of Utah is named. That was their land not too long ago. I asked Mrs. Groves how she came to be a member of the Native American Church. She said that she married into it. Her family had been Sun Dance people but she found after her first marriage at age 16 that the two beliefs were compatible and she still takes part in Sun Dance ceremonies. In fact, she is very active in both forms of native worship. She said that a meeting of the Native Church lasts all night. There are drummers, singers, a Fire Man, a Road Man, Cedar Man and a Water Woman who take part in the ceremony. In Ute traditions, women are of the day and men of the night. Therefore the singers at night are always men, although some women may sing quietly in the background. The Fire Man or Fire Chief is in charge of starting a fire and keeping it going. There is a picture of a Crescent Moon with the Road of Life leading to it. The Road Man then is the preacher who talks about life and living. The sacrament in the Native Church is not wine but rather peyote(pay-o-tee). Dried peyote buttons are taken from a container and chewed. This makes a person very thirsty, therefore the drinking of water which the Fire Man brings in at midnight is an important part of the service. Another part of the service occurs when the Cedar Man spreads the incense of cedar smoke around. At last, as dawn breaks, the Water Woman comes in to give the thirsty worshippers another drink. It all ends with a ceremonial breakfast of water, corn, fruit, and meat. I asked Mrs. Groves about the transportation of peyote which is illegal is some states. She said that the Native American Church is chartered in Oregon and there is a list of their board of directors in the state capital. It is also affiliated with the state of Texas, so they have not been affected by the ban in some states. Peyote is a cactus which grows wild only in the south, therefore the peyote buttons have to be transported to places such as Oregon. She also mentioned her Native Church's open-door policy. White professionals, such as doctors and lawyers, often fly in from all over the U.S. to take part in the Native Church ceremonies. 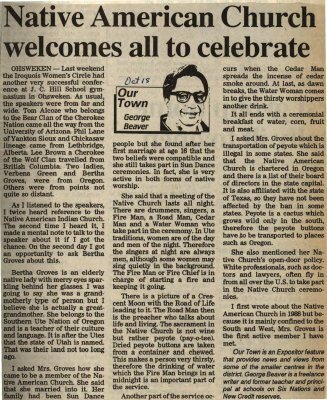 I first wrote about the Native American Church in 1988 but because it is mainly confined to the South and West, Mrs. Groves is the first active member I have met. Our Town is an Expositor feature that provides news and views from some of the smaller centres in the district. George Beaver is a freelance writer and former teacher and principal at schools on Six Nations and New Credit reserves. Alcoze, Tom ; Lane, Phil ; Brown, Lee ; Green, Verbena ; Groves, Bertha. J.C. Hill School ; University of Arizona ; Native American Church.